What could be more Brooklyn than Baseball? Baseball is such a Brooklyn institution. Sure, the Dodgers are ancient history. Still, everybody loves a good game, and the petite MCU stadium down in Coney Island, overlooking the Atlantic Ocean, the boardwalk, with seaside breezes and views of the amusement park rides, is one of the things that makes Brooklyn life worth living in the summer. Some people go to every single Cyclones game. For others, once a season is enough. But if you're a Brooklynite, or visiting the borough, don't miss a trip to Coney Island for a baseball game. 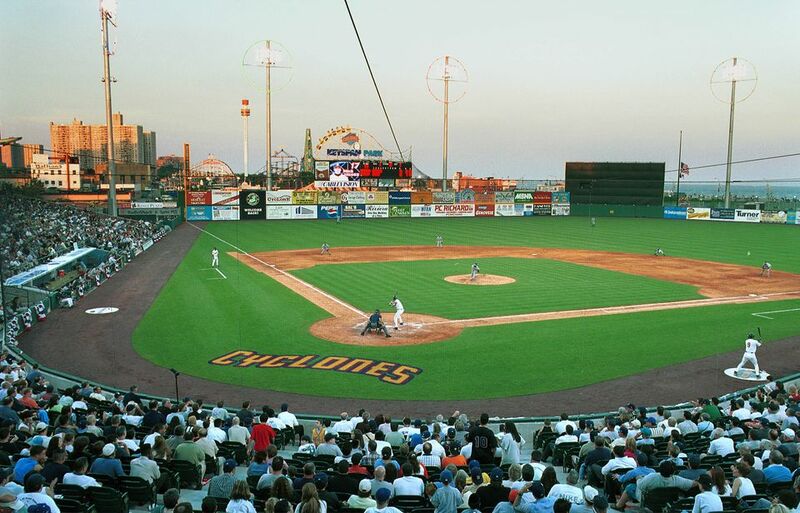 For those who don't already know, the Brooklyn Cyclones, a single A affiliate of the New York Mets, are based in Coney Island at MCU Stadium, formerly known as Keyspan Stadium. Always dreamed of playing baseball? Kids can run the bases after the games on a few days of the week, and so can 90-year-olds. Plus, there's not only the usual stadium food, but kosher hotdogs at the kosher food vendor or if you're a vegetarian you should order some risotto balls from Arancini Bros (they also have meat filled risotto balls). The whole thing is good fun. Full disclosure: The experience of a Cyclones baseball isn't the same as watching the Mets or Yankees. The games are sometimes good, sometimes not. But the crowd is great. It's a small stadium; you can just about touch the grass. And the vibe's very local, very friendly, and very passionate. There's more schtick than you can shake a stick at. Laugh with the mascot. Grab for the giveaways. Join in the cheering. Baseball, even the Brooklyn Cyclones, isn't cheap. Although you can score a field box seat for fifteen bucks, which is pretty economical. A bleacher seat will cost you ten bucks, which is less than a cost of an average movie ticket. Decide early in the season, say, in March, if you want to spring for season tickets or one of the various packages offered. Of course, first come first-served, and there are a lot of regular season ticket holders who just renew year after year. The multi-game tickets are sold first. They go on sale in the late winter/early spring. They're "loaded," meaning that every ticket comes with a coupon that can be applied to food, drink, souvenirs and other items sold at the stadium. Single game tickets go on sale in April or May. The actual availability of seats for given dates isn't announced until the sales for season tickets are well underway. Often, season ticket holders will receive vouchers that can be used for food, beverage or merchandise at MCU Park. If you love freebies, then you'll love the fact that whenever freebies are given away, you'll get them first, at the at the season ticket holder entrance until 15 minutes after the scheduled first pitch. And, you also get a receive a complimentary ticket to Cyclones Night at Citi Field in Queens. Season ticket holders get the same seats for every game, and also have a chance to buy Mets tickets for special events like Opening Day and the Subway Series. If you don't want to spend your entire summer going to Cyclones games then opt for one of the half dozen "mini plans " which offer fixed dates and more affordable tickets. There's also a Kosher Plan which "comes with all the perks associated other packages but with the additional advantage of a food voucher which can be redeemed for at the Kosher Food Cart," according to the stadium management. Check the MCU website for a variety of other package. If you have an idea for a package you'd like to see next year, you can request it. Call the Cyclones Ticket Office at 718-37-BKLYN for more information. Want to sing the National Anthem in Coney Island at a Cyclones Game? Find out the date of the National Anthem auditions for the Brooklyn Cyclones.